After the past days of sightseeing, our final day was the day to give back to the community. We woke up and drove about an hour and a half outside of the city to an orphanage for visually impaired kids. We all came in carrying bags of various health items and food which the staff of the orphanage were very thankful for. We were greeted at the door by a former orphan who had stayed there who now worked assisting the kids and staff. She was very nice and gave us a tour of the facilities while explaining how the orphanage works. She explained to us that the majority of adoptions are done by American families, although they’d had kids adopted by families from many different countries across the world. We then split up into groups and went to classrooms to meet some kids and play with them. My group went to a class taught by an eighteen year old girl named Kayla from Alabama. She was at the orphanage because it was her dream to become a missionary with her sister, traveling the world. They were both teachers at the school and seemed very good at their jobs as teachers. They knew the kids quite well and it was good to see that the kids were well cared for. The kids in my classroom seemed to range in visual ability, some of them could see quite well and could even separate different colored cereal while others seemed reluctant to. None of the kids seemed absolutely blind though. We took them out to the playground to play around and see how well they are able to enjoy themselves with their limited sight. They needed a little assistance but were mostly able to do everything they wanted on the jungle jim they had. 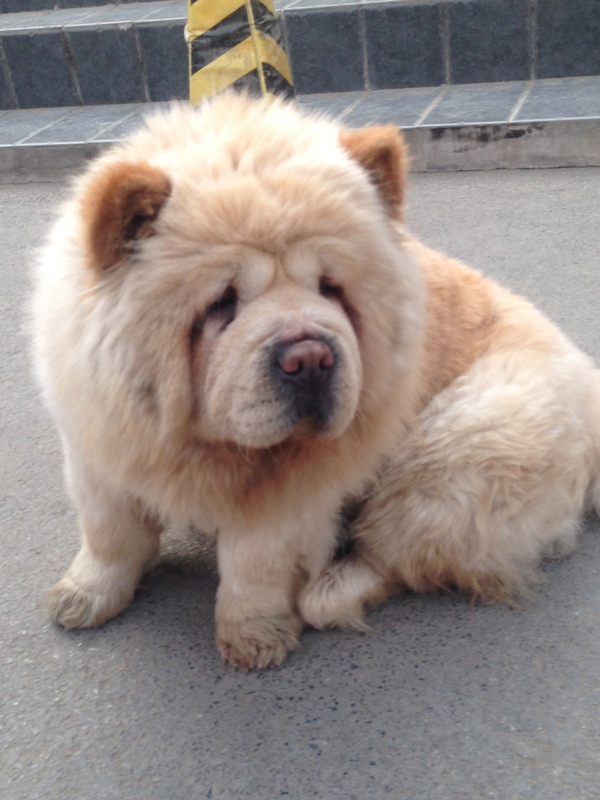 The one thing any of us really had to help them with was to “bao bao” them. None of us knew what “bao bao” meant going into the orphanage but we all learned it very quickly. It pretty much means “pick me up, I want attention” because the kids would raise their arms and yell it at you when they wanted to be picked up and played with. It was a very great experience and I’m glad we were able to see the kids and their living conditions. This is a picture of the kids in their dining room having lunch. This was probably the biggest room at the orphanage which makes sense but shows the limited space indoors the kids had. It seemed like they had enough room in their classrooms and in the rest of the building and certainly outside but the condition of the building they were in could have certainly been better. It was also very interesting and slightly saddening to see where the orphanage was. It was in a very poor area outside the city limits of Beijing which doesn’t seem like the type of place an orphanage like this should be. After the orphanage, we drove back into Beijing and went to the infamous pearl mall. The pearl mall is the place to go if you want to buy any knockoff or fake item which would otherwise cost hundreds of more dollars in the U.S. The first floor had mostly electronics which meant everything from phones to headphones to tablets. I was immediately greeted by various sellers asking me what I wanted and assuring me they had anything I wanted. The second floor was full of handbags, belts, shoes, shirts, and various other articles of clothing and accessories, all of which had brand names on them like Gucci, Armani, Louis Vuitton, and any other high end brand you can imagine. None of the things being sold were actually products of the companies though and most of what was being sold was quite illegal. Their were some cops there who I’m sure were aware of what was sold there but didn’t seem to care at all. I gave in to the appeal of all of these fake products and bought myself and my family some very convincing knockoff items. My bargaining skills and Chinese were good enough for me to get the lowest possible prices for most of the items I bought, leaving me satisfied and a few shopkeepers either angry at me (one tried to keep my change) or wanting me to buy more of their stuff by putting other random products in my bag and demanding more money or by following me up elevators yelling at me to come back. Honestly, I enjoyed the game that came with buying things at the pearl mall and other places where bargaining was necessary because I was able to work on my Chinese and I felt much better about buying something for ¥100 after the price started at ¥600 (the conversion rate for Yuan, the Chinese currency, is about 6:1). After shopping around for a while we went back to the hostel, had our final dinner in Beijing, and went back to the hostel for an early bed time since we had to leave there at about 5am the next morning. We got up early the next morning and were driven to the airport for our two hour flight to Shanghai. We all said our goodbye’s to Jack and Mr. Lee who had both been great tour guides for us throughout our explorations of Beijing. Brian stayed with us and would be with us for a few days in Shanghai before having to leave us. We arrived in Shanghai at about noon and met our new tour guide who’s name was David. He took us on a bullet train which reached a top speed of about 430km/h on our seven minute ride to where our bus was picking us up from. One of the first things we noticed was the warmer weather which was a pleasant surprise to all of us. It had been consistently in the 40’s in Beijing but we were greeted by 60 degree weather in Shanghai. We learned that this was because Shanghai is located on about the same longitude as Los Angeles which meant great whether. We went straight to our hotel which was a very nice Four Season by Sheraton located in a central location in Shanghai. It was a very upscale change from the hostel which also served as a metaphor for the comparison between Beijing and Shanghai. We could already tell from our short time there that Shanghai was a lot more upscale and had more of an upper class than Beijing. It was obvious to us that Beijing was the cultural capital of China for a reason, and Shanghai was the financial capital for others. After a little bit at the hotel, we went to the biggest mall I had ever been in which was surrounded by some of the most prominent buildings in Shanghai. We were able to shop there for a little while before going to the world financial center. The world financial center tower is one of the iconic buildings of the Shanghai skyline because of it’s amazing architecture and size. It’s the building with the gap at the top of it. This picture doesn’t do it’s size justice but the world financial center has 100 floors and the only taller building in Shanghai s the one still being built right next to it. The new building, The Shanghai Tower, is going to be about 130 floors and will be the second tallest building in the world when finished. At the world financial center, we took an elevator to the 100th floor which is an observatory which is the part of the building above the gap seen in the picture above. 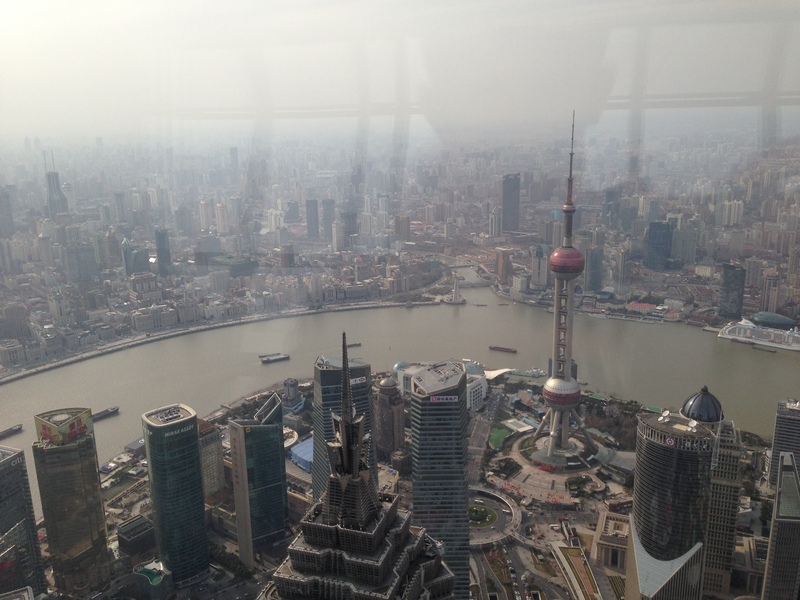 The view from this observatory was amazing and gave us an understanding of the size and position of Shanghai as a major city of the world. You can see the Oriental Pearl TV Tower which is the peculiar looking building near the middle of this picture. The mall we were at is in the building just the the left of the TV Tower. You can also see the vastness of the city which has skyscrapers spreading out for as far as the eyes can see. The city of Shanghai is separated by the Huangpu river which is a branch of the yangtzee river which empties into the east China sea. The Huangpu separates Shanghai into the east side, which we were currently in, and the west side which is where we would go for almost everything we had to see while in Shanghai. Perhaps the most iconic thing in Shanghai is the walkway across the west side of the huangpu called The Bund which is the walkway along the left side of the far bank of the Huangpu. 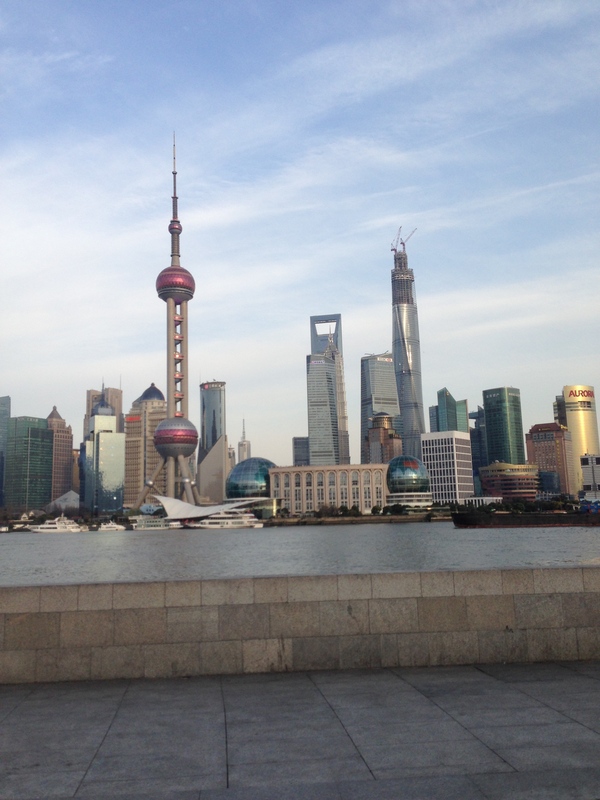 The bund is the place where the best views of the Shanghai skyline can be seen and it was the next stop for us. You can see almost every major building of Shanghai from The Bund which is especially amazing at night. After walking along The Bund we had dinner at a restaurant right next to it and went back to the hotel. 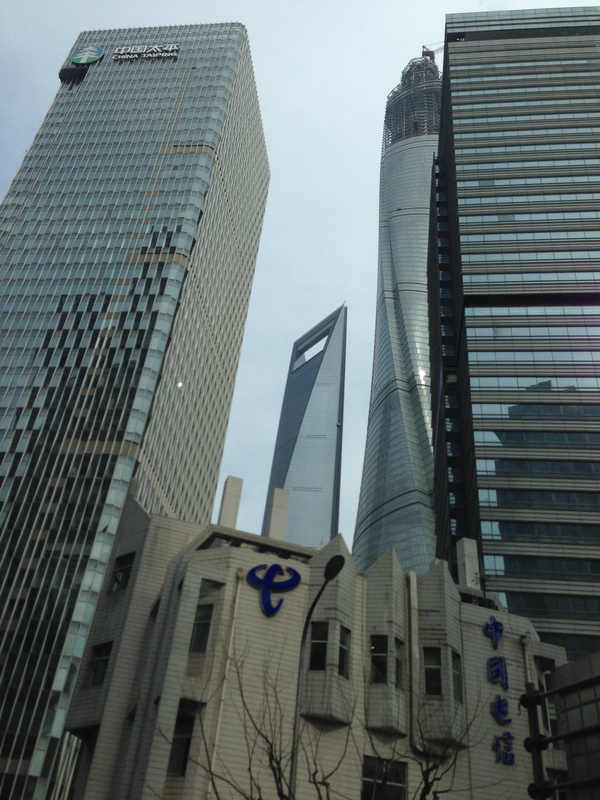 My first opinion of Shanghai was that it was like a bigger, cleaner, New York City. It was very clear that it was the financial center of China and was a completely different place from Beijing. The next day, we went to a very nice high school in China. We were toured around by a British teacher at the school and a few students who were seniors of the IB program and were all going to University in America next year. The school seemed bigger and better than the one we had seen in Beijing and we saw a fair number of international student there. We even ran into a former art student at West Chester University who was very eager to talk to people from a familiar place. After the school we got lunch and went to a silk factory and shop to see how silk is made. The process was explained to us very well. 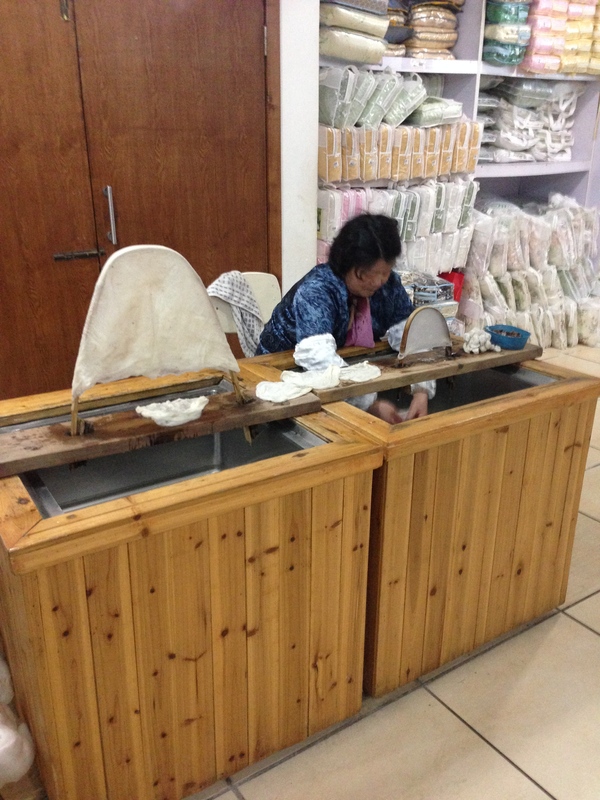 It was amazing to see how the workers there were able to take silk worm cocoons and end up with silk cloth. Their were few workers there and I’m sure what we saw was just a little manufacturing place, more for show than to make silk products for the shop we were ushered into. After our tour of the factory and shop, we went to an orphanage for mentally challenged orphans in the city. 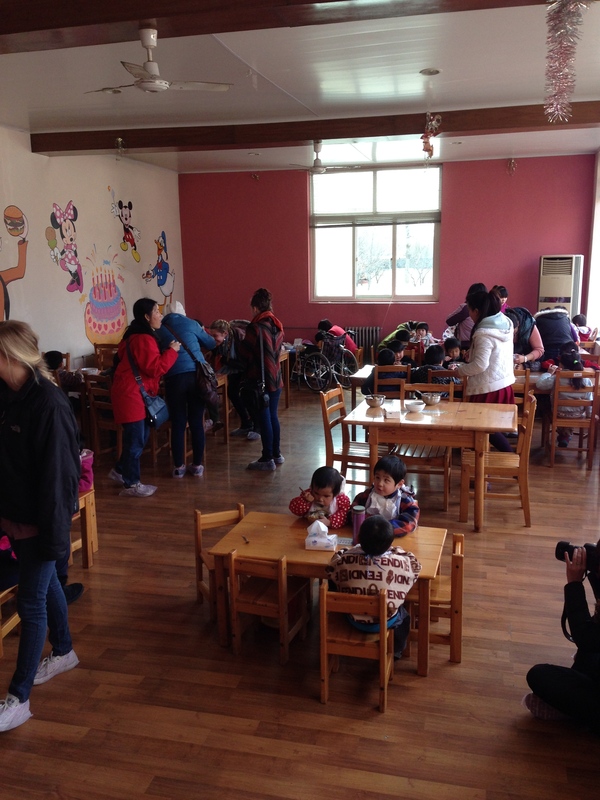 This orphanage was in the city but the facilities were not as good as what we had seen at the orphanage in Beijing. We again brought gifts which they were very thankful for but we weren’t able to play with the kids much because of the nature of their disabilities and the extra care that had to be taken because of them. After this sobering experience, we went out to dinner and then to the Shanghai acrobat show which was an amazing performance. It was a lot like a cirque de soleil performance and was very enjoyable. Afterwards we went back to the hotel and said our goodbyes to Brian, who had to leave early the next morning. Our first full day in Shanghai was very busy and left us with more of an understanding of the city. We got to see that although it was a much more modern and upscale city than Beijing, their was certainly still a lower class struggling to keep up with the growth of the city. As opposed to Beijing where most people seemed to be in a lower-middle class, Shanghai had a prominent upper class with a steep decline into a lower class. Their seemed to be a growing middle class which was apparent by the quantity of consumer goods in the shopping districts of the city but this was also because of the city attracting a lot of wealthy travelers and business people from around the world and not necessarily only because of a growing middle class. The city definitely had more foreigners than Beijing who were there to enjoy the world class shopping, views, and change in culture of one of the least known and fastest growing places in the world; although the culture was hard to experience if you were only in the upscale parts of the city. Our experiences in Shanghai were just beginning but we all had almost unanimously already made up our minds that Shanghai was the place we would rather visit if we ever came back to China. It was a mix of the better weather, more upscale living, and modern changes to the city which I think reminded us more of cities back home and made it more appealing to us. Week three was the finale of my internship, and what a week it was! I have a lot to cover, so I might as well just jump right in. Here it goes! The biggest change that happened this week was that I switched residences from my relatives in New York City to my relatives in Plainsboro, New Jersey. Although this meant that I would have to learn a new route to and from my internship, I welcomed the change since I knew that it would be a good experience that would teach me more about commuting into New York City. Although the daily commute by train was somewhat longer (roughly an hour each morning and evening), it was still pretty simple and allowed me to see some new parts of the city when I traveled to and from the train station. Now, if you read my post about the first week of my internship, you might have gathered that there was a bit of a learning curve in terms of transportation. My new commute by train actually went quite well. There was only one time when something went slightly awry and it was out of my hands. On Thursday, the train I was taking into the city was heavily delayed and stopped at a station on the outskirts of New York City. The conductor announced that it would likely be 30 to 40 minutes before we started moving again, so if we needed to get into the city quickly we should use the express subway that also stopped at this particular station. I didn’t want to be late for my internship, but I also had no idea where the express subway would let me off and if it would be anywhere near Jigsaw. After some thought, I decided that I would rather take a chance and see where the express subway would take me as opposed to waiting for the train to get moving again. I exited the train and got on the subway, intent on checking which stops were available. However, only about 30 seconds after I got onto the subway and started looking at its stops, I heard the telltale hiss of the train, as it closed its doors and drove off, well before the announced, “30 to 40 minutes” of delays. Fortunately, through the kindness of some New Yorkers and some careful observing, I found that there was a transfer subway that would take me very close to Jigsaw. And so it all worked out in the end. My work at Jigsaw Productions went very well during my final week of the internship. For the most part, I was continuing my work with photo logging and scanning pictures, but I also was able to take part in a few more activities throughout the week. The newest sort of activity was shooting some B-Roll footage for one of the other Jigsaw documentaries. B-Roll is used to overlay footage when people are talking for extended periods, and it isn’t necessary to see them speaking the whole time. For instance, if somebody is talking about Babe Ruth and how he was the Home Run King for many years, the editor may choose to show footage of Babe Ruth hitting home runs and scoring while this person is talking so that the viewer can visualize what the speaker is saying, as opposed to just seeing them tell their story. Anyhow, the B-Roll that I was helping to shoot was of a paper ball being thrown at a trash bin full of crumpled paper, which would result in several pieces of paper falling out of the bin. Now, this may sound incredibly easy and simple to you. You may be thinking that this sort of footage would only take 5 minutes, at most, to shoot and have ready to present to the editors. In reality, this process can actually take much longer. There is a lot to think about when framing any shot, and this B-Roll was no exception. From a technical stand point the lighting, angle of the shot, background, and position of the object all have to be taken into account before the footage can be taken. Then, it is important to consider how the shot will look to the viewer. Should the ball travel with an arc towards the trash bin, or should it be thrown directly at the bin for greater impact? Is there a way to make the shot more dramatic by changing the lighting, angle, or focus of the camera? How would the shot look in slow motion? All of these factors were very important to think about, and as a result, taking this seemingly simple B-Roll actually ended up taking around an hour to shoot. This was one of my favorite experiences from week three. It really helped to show me just how much work goes into every shot of a film, and how much care was put into even the simplest of tasks. The other amazing experience I had during the final day of my internship was that I had a chance to see the rough cut of the documentary that I’d been working on. Rough cuts of a film are essentially what they sound like, versions of the film in which the editors test out various constructions of the story to see what works and what doesn’t. I felt very privileged to see an edition of the film that nobody else would ever view, and to see where my work had been going. I saw some of the pictures I’d logged being put to use in the film, and how the story went together. It felt like a true culmination of everything I’d done over the past three weeks. In addition to taking B-Roll footage and seeing the rough cut of the documentary I’d been working on, I also got to work on filming my own short documentary. I wanted to capture some of my experiences on film by interviewing the staff at Jigsaw whom I’d worked with to ask them why they joined the film and media industry, where they’d learned the most, and what advice they had for aspiring film makers. It was awesome to get some personal experience filming my own short film, and I’m excited to start editing and putting together my footage. Now that my Senior Project is finished, I look back on the past three weeks and realize just how much I’ve gained from my experiences. I learned so much from everyone I worked with over the course of the project. Whether it was only for one day or for the entire three weeks, each person taught me something different about the film and media industry that I hadn’t known prior to my Senior Project. Although my Senior Project may be finished, I will take these lessons wherever I go. They helped me to learn more about where my interests lie, and about an amazing industry that I am very excited about. It’s been a wonderful three weeks that I will never forget. Thank you to everyone who made it possible! I cannot tell you how much I appreciated this opportunity. You have my deepest gratitude. My second week interning at Jigsaw Productions went very well. This week started off with an interesting adventure. On Sunday I decided to visit the Metropolitan Museum of Art, one of the coolest places in the city. When I had gone as a child, I was not able to appreciate all that the museum had to offer, unless you want to count the Arms and Armor display as the entire museum. Being older, though, I was excited to see the museum on a grander scale. All in all, the visit began well enough. I started by viewing the Egypt exhibit, followed by the Sculpture, 18th Century Home, American Artwork, Arms and Armor, and Exotic Instrument displays. When I finally ended up in the European Paintings exhibit, I realized that I had no idea where I was in relation to the exit. I had forgotten to pick up a map on the way in, so I had no way of knowing where I was in the sprawling Metropolitan Museum. Normally, this wouldn’t have been much of an issue, but I knew that it was getting close to closing time, so I wanted to be cognizant of where I was so that I wouldn’t still be wandering around the exhibits while the museum was being closed down. I enjoyed the challenge of finding my way out of the museum well before this became an issue, so I didn’t end up in a situation similar to Claudia and Jamie from The Mixed up Files of Mrs. Basil E. Frankweiler. Though I’ll admit, that would have been fun as well. Apart from this minor incident, my week went exceptionally well. Unlike the first week, transportation never proved to be an issue. This took a weight off my shoulders, which allowed me to put my full energy into my work. This week, most of my activities were focused on scanning and photo logging. The consolidation of my work allowed me to perfect my skills in both, and to get into a working rhythm. It felt exhilarating to constantly challenge myself to work at a faster pace, while still creating the same high quality product. I was also happy to know that the people I was working with were appreciative of my work. Throughout the week, I had a chance to have lunch and trade jokes with them, which allowed me to get to know them better. This made working with them even more enjoyable. I also gained a lot by just listening to them, even when they weren’t talking to me. From their conversations I learned about the various processes that surround getting the rights to archival footage and pictures. I can’t tell you any specifics due to my confidentiality agreement, but I can tell you that there is much more thought and planning that goes into this process than you would imagine. Hearing about the complexities that surround this process was fascinating, and it really helped to broaden my understanding of the how a documentary is made. Speaking of the process that documentaries undergo before completion, I was able to attend a meeting at which the Jigsaw staff members who were leading the project I was assigned to met with their adviser and editors. During this meeting, the adviser and editors would ask for updates on certain tasks, cancel others, request footage, begin inquiries, and discuss other various topics. This provided a context and helped me better understand the importance of what I was doing when I logged and scanned photos. These photos fulfilled the various requests and needs of the editors and advisers. It helped make my work more enjoyable and meaningful to me, since I had a more exact idea of the purpose of my work. Before I even knew it, the week was already over, and I was very happy with what I had accomplished thus far. I was completing my assignments efficiently, gaining more and more knowledge of the city, and constantly building confidence as an intern. At this rate, week three will definitely be the best of them all. I can’t wait for it to start! I know I said I would update you when I got to New Orleans, but I have been busy and exhausted since my arrival here on Tuesday. We have been exchanging stories with my mom’s cousin, Robyn and her kids, Beth and Jen. Although Robyn didn’t grow up here, Beth and Jen did so I thought it was also important to try some of their favorite, native foods. Robyn isn’t much of a cook; when she was living with my mom when they were in college, she was boiling eggs and forgot about them. The water evaporated, and the eggs went flying, smashing into the ceiling. Robyn has become a better cook since then, but she wants to learn Momma Bubb and my mother’s recipes. 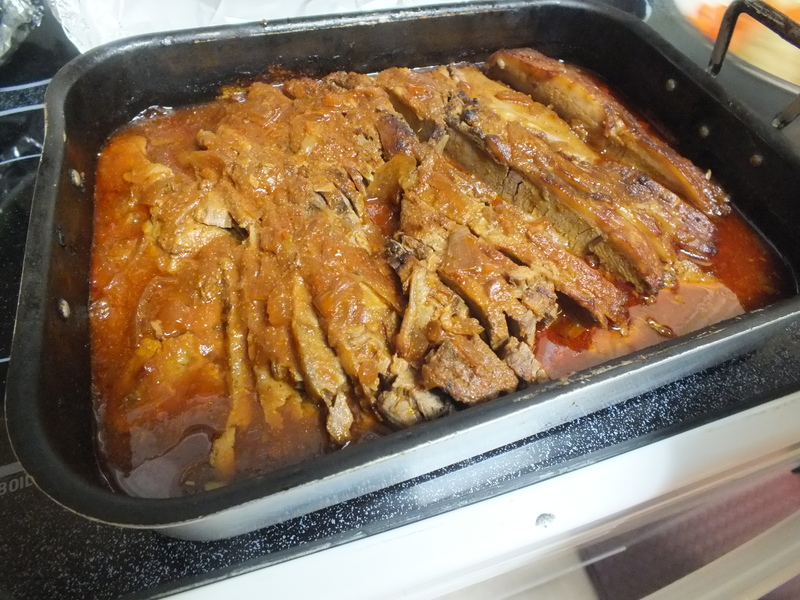 That reminds me… here is Momma Bubb’s brisket that my mother and I made with Aunt Billie when we were in Miami. I had never made brisket by baking it either, so it was interesting to know how much easier it was to make this way and to see how well it turned out. I think I will stick to making my brisket on the stove though, because you cannot cut out all the fat if you are baking it. And I hate fat. On a side note, I found out that Bob, Robyns husband makes brisket is a Crock Pot. Anyways, I also told you that I was going to be making tzimmes. 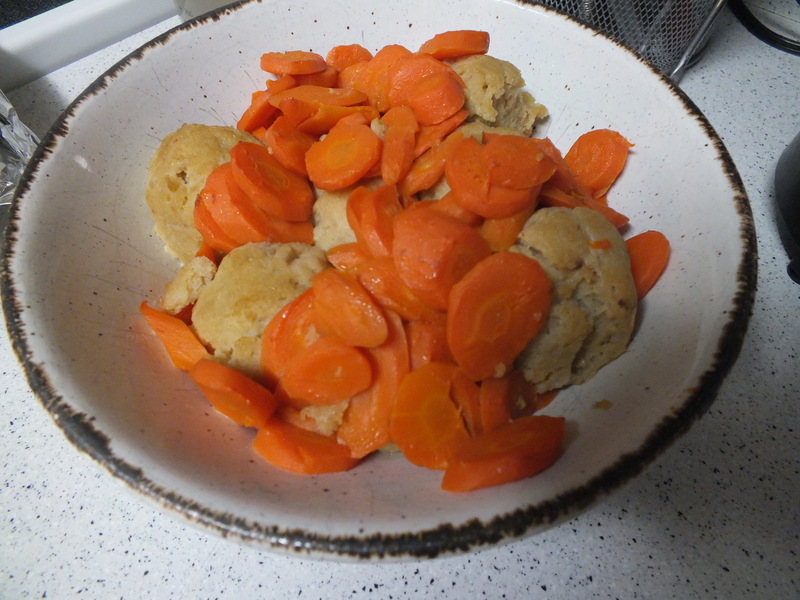 Tzimmes is like sweet matzah balls with candied carrots. When I told Robyn’s family about it, they cringed at the thought of it. But it was delicious! The tzimmes, like the brisket was also Momma Bubb’s recipe. We looked at pictures of Momma Bubb and Daddy Bubb, and even found a picture of their wedding at Aunt Billie’s house. 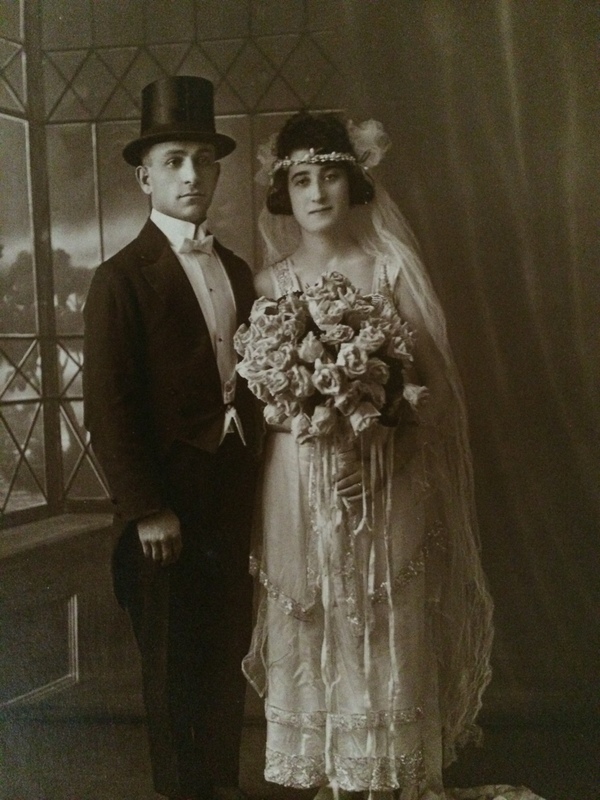 Momma Bubb and Daddy Bubb at their wedding. It was crazy to see all these people who I never have and never will meet. 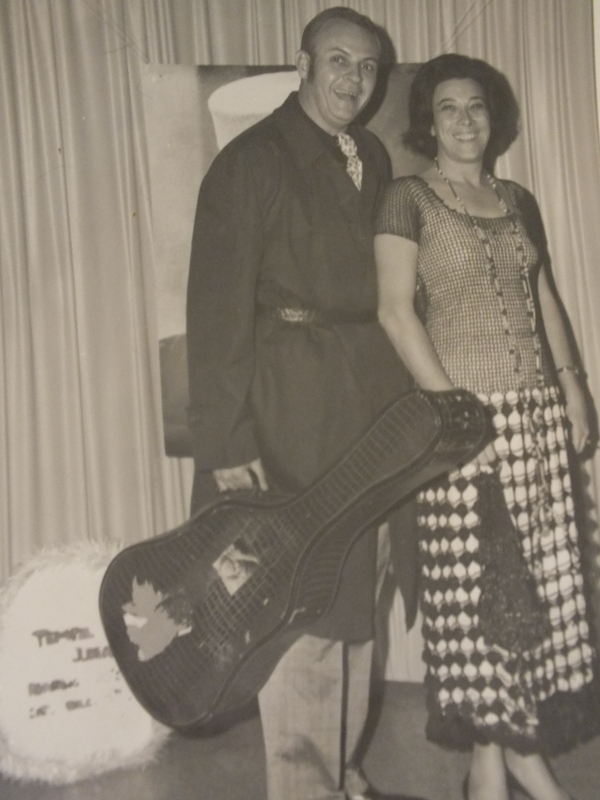 It pains me that I never was able to meet Uncle Fred, Aunt Billie’s husband before he passed away over the summer. Aunt Billie and Uncle Fred dressed up for Purim. This picture is over 40 years old! It really made me glad I was doing this project now, and that it isn’t too late to start caring about this. In fact, my mom and I are trying to make plans to go see my other second cousin, Briahn at her Bat Mitzvah in June. She is Aunt Billie’s granddaughter, and I think it will open me up to a lot of my other family who I have never met before. Anyways, since I have been in New Orleans, my mom taught Robyn how to make chicken pot pie, one of her specialties. 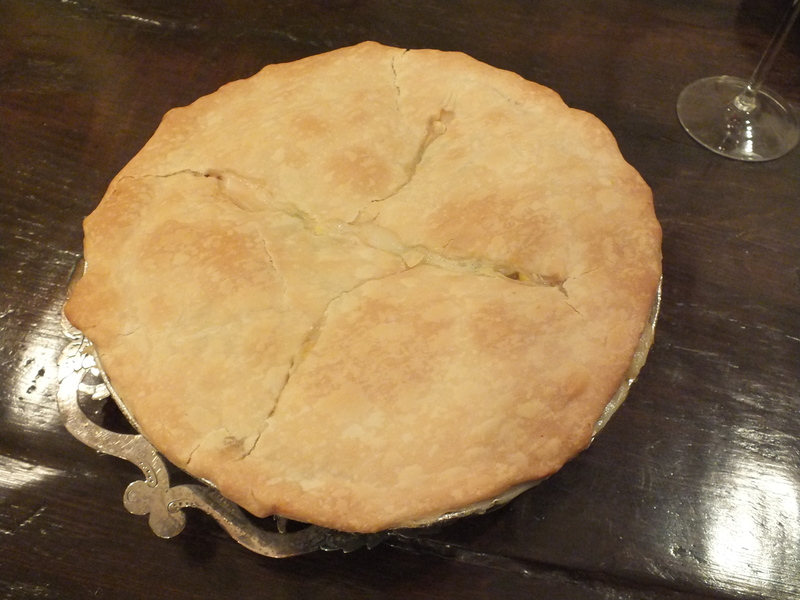 It turned out delicious, as I would expect despite the fact that we made SIX pot pies at once. If you are not a cook, multiplying a recipe by six is a little risky. 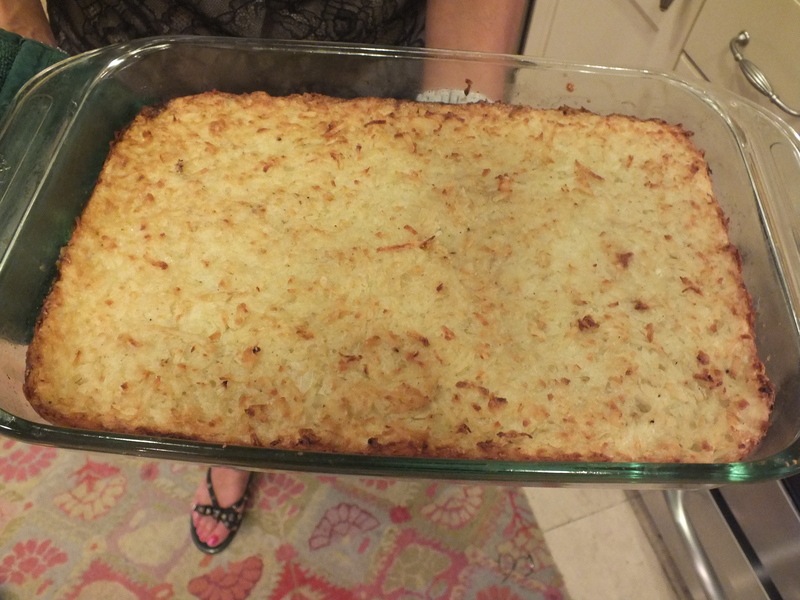 And we were able to make Momma Bubb’s potato kugel! No one, with the exception of Momma Bubb has been able to make it before. She uses words like keep adding whatever until it feels “right.” And for once, with the addition of another egg, it was able to come out just the way she made it! We are going to continue to teach all them these recipes, and get the few recipes Robyn does have to put into my cookbook. Robyn and Bob have been living in New Orleans for over thirty years- the food here a big part of their life. And I need to make sure it is included in my cookbook! This might be my last post until I get home on Monday to reflect upon my trip. So have a nice weekend despite any horrible weather…. I know its pouring here right now, but at least I have a cup of coffee and the brisket aroma to keep me warm today. Leaving DC’s Dulles International airport at 12:20pm on March 7th, the fourteen hours and 6900 miles we had to go seemed incredibly daunting. Our eleven-person group got through the plane ride mostly by listening to music, watching the movies provided, and most importantly, sleeping. Looking out the window as the pilot announced we were approaching Beijing’s airport, it still looked like we were ten thousand feet in the air in the middle of the clouds. It wasn’t until our wheels hit the ground that I realized we were in the infamous smog of Beijing. I couldn’t see any hint of a city as we landed because of the extent of the smog. 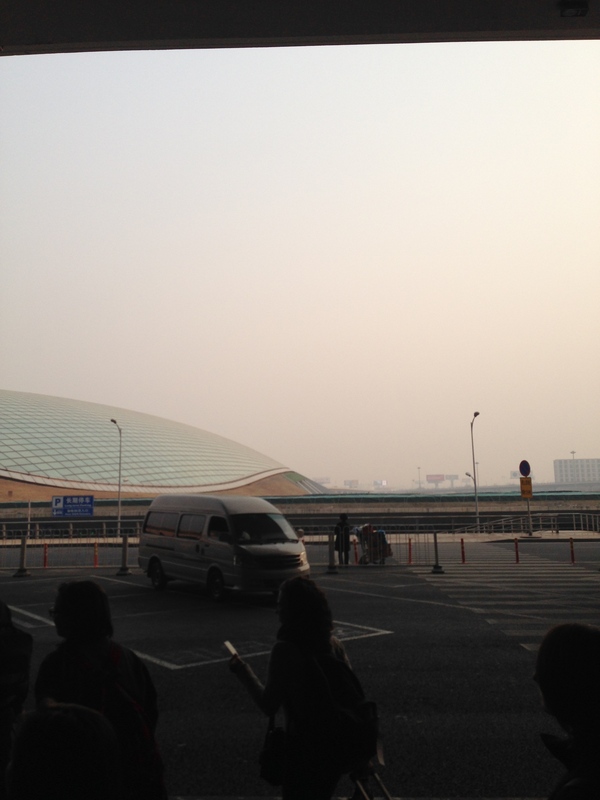 We finally arrived in Beijing at about 3:30pm on March 8th. After getting through customs and getting our bags, we met the representative from CLI (the group we were using to guide us through China and our tour guide for Beijing). The CLI representative’s name was Brian, he was a twenty-four year old graduate of James Madison University who had been living in China for the past two years. Our tour guide’s name was Jack, he was born and raised in Beijing but spoke English fairly well. He always had a big smile on his face and seemed to know everything there was about the city. We all boarded the van we would be taking around the city for the next five days and drove about an hour to the hostel we would be staying at for the next five days. Our driver’s name was Mr. Lee, he was a fairly quiet man but a very reliable driver in a city which seemed to have few rules for driving. The last time I left you, I was still in State College. The last couple of days I was there I was trying to talk to Mama Trudy about her childhood. That was a little bit of a failure; All she told me was that her father was an engineer and he lost a lot of property during The Depression. It was a little disappointing, but my mother told me that she had a very traumatic childhood. Mama Trudy’s mother passed away when she was 4 years old, leaving her father to raise nine children on his own. My mother said that her older siblings used to tell stories, but now a lot of them aren’t around to say them. We left Ollantaytambo and headed to the bigger city, Cusco, where we would spend our last night and complete our final purchases before our flight to Lima and then to JFK. This was a nice hotel that had a beautiful outdoor courtyard with gardens and a breakfast room that was made entirely of windows. When we arrived in the afternoon we split off to do what we wished and were only told to stay in groups of at least four. I stuck with a group of five other girls and we decided to head right out and do some shopping. We had been consistently told throughout the trip to save our money until Cusco because everything would be cheaper there, so we were in desperate need of gifts for our families and friends at home. We walked down to the different markets where there were many vendors selling colorful tapestries, sweaters, t-shirts, jewelry, and other trinkets. It was hard to resist all of the beautiful things they had displayed. The vendors were pretty aggressive but we quickly learned how to bargain and were proud to tell our friends of the good buys we made.